Look at the amount of lag that Sergio Garcia has in his swing at this point (the picture on the right). 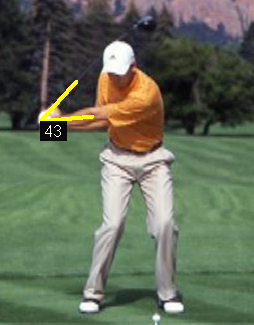 It’s simply a measurement of how much angle there is between your left arm and golf club in the downswing. So what is the secret to getting lag like this? 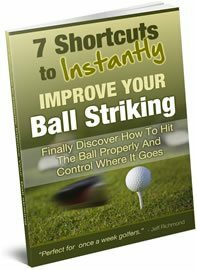 Well, it has been scientifically proven that the golf swing is moving way too fast for you to consciously make changes as you’re swinging. 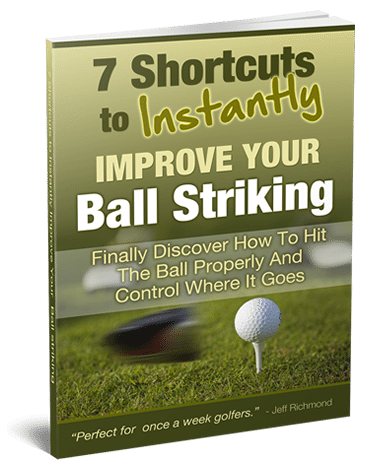 But if you do try, what you think is happening at a certain point in your swing, is actually occurring a lot later than you think. That’s simply because the golf swing is moving so fast. Lag is the direct result of all the bodily movements that has proceeded the half way point in the downswing. I emphasize the words “bodily movements” because increased lag can be trained with drills, there’s no doubt about that. In this program there are a lot of drills given to improve your lag. But the first place you should be looking to improve your lag is with your body. Because if your body is stronger, more flexible and in better balance, then you will be able to increase lag. Without improving your body to improve your lag, you are putting the cart before the horse. So the secret to lag is to first improve your body, so you can get into a professional lag position. Then use drills and training aids to train you to lag the club. I generally find golfers go for the training aids and drills first, and neglect the body when trying to get more lag. And I see all the time, amateur golfer trying to emulate a professional golf swing and they don’t have the body to do it. They will never get into professional like positions unless they improve their body. The bottom line, and the secret to improving your lag, is to improve your body so you can do it. And that advice also applies to swing speed. As you know, the faster you are swinging the further the ball is going to go. But you can’t just try to swing faster. You need to improve your body to allow you to swing faster. Here is the best, most complete program to teach you how to do that. It also includes drills to improve your lag as well.